Several People have told me that the building on Westwood Hill, one down from the Astra was at one time the German embassy (it has ane Eagle on its roof). I have emailed the current German Embassy but no news as yet! An ambassadors residence is not necessarily an embassy. Chris, the account of Beltwood is almost completely fictitious. The house was built in 1851 for Edward Saxton, who was a solicitor. The Saxton family lived there quietly and unobtrusively, until 1914. Since then no diplomat or indeed anybody with a German name (and this includes members of the Royal Family), has lived in the house and I'm not aware of any evidence that any of the people named even visited the house. From the time it was built until 1940 34a Sydenham Hill was the home of Theodore Schlund and his family. Although he was born in Germany he was a naturalised British subject, and a warehouseman. And the building on Westwood Hill, no. 108, called Sunnydene, was built by William Sutton, described as a "millionaire entrepreneur and a housing philanthropist". His widow continued living there after his death, and by the 1930s the house had been divided into flats. I know of at least three other houses in Sydenham or Forest Hill that have been suggested as the home of the German ambassador and not one of them stands up to scrutiny. That doesn't mean that a German ambassador did not live in the area, only that there is currently no evidence to support it. I love how (of you click on the RatesToGo link) Beltwood is Sydenham Hill and an SE26 postcode yet those clever marketing people have placed it in the 'fashionable residential district of Dulwich' Or is this actually correct? Ive been to Beltwood House recently Greg. I got my puppy from there. Its in a state of disrepair and has been neglected for a while. It would have been an impressive residence at one time and has extensive grounds. Around 3 occupants of Crystal Palace Park Road houses have visited the Crystal Palace Museum, mentioning to me about them being former embassys for different European countries, including the tenant of the building with the eagle on top. I first heard about it some 15 or so years ago when I visited a cat breeder in one of the houses, who told me about the German Embassy house, and showed me a blocked up tunnel in her back garden. * All this talk of embassys has spread around by word of mouth, but as Steve points out, there is no evidence to support it. *I wish I could remember which house this was, as I suspect it could be one end of the atmospheric railway--hearsay again--I was told it was a war tunnel. 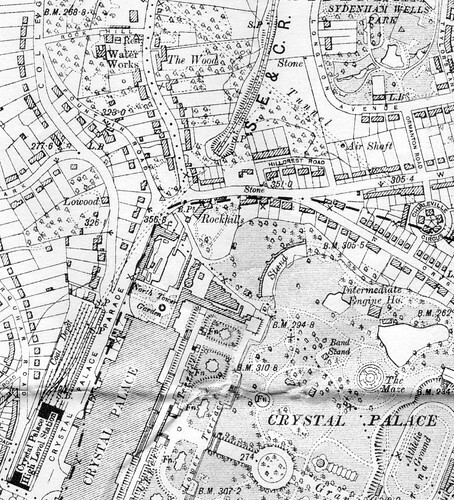 BTW, I was looking at some old map before the palace was built, and it appears Rockhills was the first house on Crystal Palace Park road? Thankyou all for your replies. This probably explains why the current German Embassy in London knew nothing of ambassadorial connections in Sydenham. Its amazing how rumours start in this area! It does seem that Sydenham/Forest Hill had one of the major settlements of Germans in hte UK for the period - but no embassy it seems. I did also hear a story about tunnels from Sunnymede to the Park, I'll have a chat to the Head Park Warden about that. Chris, I'm glad (relieved?) that the German embassy confirms what I had long believed. The railway line to the Crystal Palace High Level Station (marked SE&CR at top centre of the map) enters a tunnel. It emerges just by the junction of College Road with Crystal Palace Parade. The entrance to the tunnel still survives, although blocked, in the Hillcrest estate and is clearly visible from the back gardens of Sunnydene and other houses at the top of Westwood Hill. There may well be surviving tunnels within the CP grounds. In 1864 an experimental underground railway was built, somewhere near the Sydenham Gate but entirely within the CP grounds. Part of this tunnel was excavated in 1989. However, there is no connection with this tunnel and the houses at the top of Westwood Hill. Its really rum how this rumours persist. This story about the house with the eagle was told to me around 1962, by a woman councillor who lived in Longton Grove, and who was herself regarded as something of a local historian. One of the interesting things I find on this site is how much of what I had as received wisdom as forty odd years ago as been shown by diligent research to be bunkum. I notice that the woods all around the house are labelled "Dulwich Woods Estate" must be in Dulwich then, although the gate-house on Sydenham Hill road seems to be in SE26 !! Browsing through an estate agents brochure recently, I noticed another property being marketed as "an imposing converted embassy building backing onto Crystal Palace Park" and remembered this thread. I don't suppose there's any truth to that claim either is there? My mother stayed at a residential home called Homelands off Church Parade, Crystal Palace. The home had a German connection and embassy staff used to visit the home before it was recently closed. I still think somebody needs to find that house with blocked up tunnels in their back garden. It was a cat breeder living there in the late 1980s who told me about the German Embassy and showed me where the "war tunnels" were located. I resided a Beltwood for quite some time and believe there must be a connection to the German Ambassador as the house had arched stained glass windows in the foyer, with German inscriptions on them and a German family name and crest. I cannot see how an English solicitor would want to have these installed. My Grandmother told me this story of The Imperial German Ambassador's residence in Sydenham Hill. She was convinced it was correct . True she was born only in 1888 but lived in Sydenham and that covers the time up to The Great War. Campling, I'd be interested to know more about the German inscription and particularly the German name. I've been round the house, and taken photographs, but can't recall seeing anything that matches what you've described. I've managed to trace most of the occupants of Beltwood, and there is not a German amongst them. The house was built in early 1851 (a couple of years before the Crystal Palace was re-erected here) by London solicitor Edward Saxton. Saxton died at Beltwood in 1911, aged 97. Members of his family continued living there until 1914. From 1914 until about 1924 John Pickering and his wife lived there. Then the occupant was Vincent Holder until the late 1920s when Athelstane Wilson Cornforth bought the house. He continued living there until the mid-1940s when the house ceased being a private residence. Between about 1949 and 1962 it was the Sydenham Hill Babies' Hospital. The YWCA used the house from 1963 until the mid-1980s or later. As far as I am aware no diplomat, or indeed anybody with a German name, has lived at Beltwood. However, it is possible that George Harrison visited the house. Several sources say that on 29 August 1969 “George and several busloads of journalists attended the Apple Press launch of the Radha Krishna Temple’s first recording… in the gardens of a large country house in Sydenham”. As a YWCA hostel, Beltwood seems a very likely venue for such an event. Just as matter of interest, anyone know what is happening with Beltwood now? Was up there a couple of years ago to get a dog and understand that tennant has moved on. Looking at www.houseprices.co.uk (which records house sales) there is no record of Beltwood being sold in the last couple of years. It's a very interesting place - thanks for the information about it Steve. The only other thought I had (and this might be rubbish) is that perhaps someone of German origin did live there but they had anglicized their name beforehand. Anyway, if <this> is to be believed, we can all spend New Year's Eve there. I was interested in this query about the German Consul as I am at the moment reading a diary written by my grandmother about her early childhood. Her name was Hilde Holthusen, she had three sisters and one brother, her parents were Ludwig and Margaretue and lived in 17 Bishopsthorpe Road, Sydenham. She later married a Fritz Hammer and lived further up at 33 Bishopsthorrpe road. I know that this does not tell you if there was a German embassy here but the information might be of use to someone. Does any body know if Lambourne school still exists ?